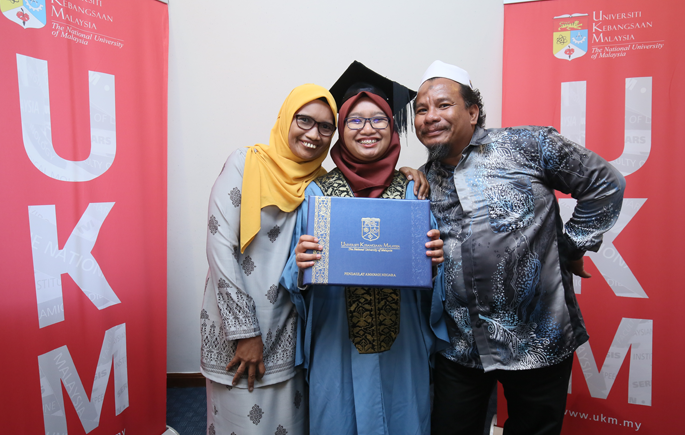 BANGI, November 13, 2018 – The Temuan Orang Asli children’s heritage which is the former inhabitants of Universiti Kebangsaan Malaysia (UKM) site, Nur Ilmiah Rosli has proven that life’s hardship is not a barrier to success. She, who graduated with 7,021 UKM graduates has obtained her Bachelor of Accounting at the 46th UKM Convocation Ceremony. Nur Ilmiah, Orang Asli of Kampung Sungai Buah, Dengkil is the eldest of her eight siblings. Her father worked as a security guard while her mother was a full-time housewife. According to her, the encouragement and support of the family is the backbone for her success today. “Mom and dad often advise that whatever I’m doing, I have to do it with great diligence and good intentions,” she said. Nur Ilmiah Rosli also intends to continue her studies to the Association of Chartered Certified Accountants (ACCA). She hoped that young people in her hometown would not make their situation as an excuse for not succeeding. “I remind myself and my friends in the village to study hard and try to improve the education and living standards of the Orang Asli community. “To succeed, we need to wake up and pursue our dreams. Do not just be comfortable with what we have but keep on working and improving lives,” she added. At the beginning of UKM development, around the 1970s, the UKM campus site was where the community of Temuan Orang Asli live. UKM is indebted to the entire Orang Asli where they willingly relocated to see a national university that promotes Bahasa Melayu to be developed in Malaysia.